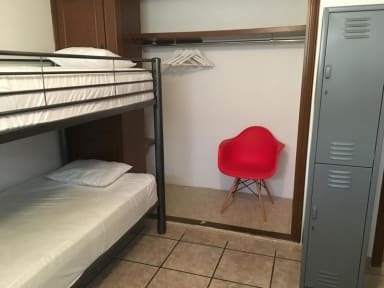 Hostal San Jemo i León, Mexico: Reservér nu! Please advise at least one week prior arrival since a group booking means to block great part of our inventory. We will request 50% deposit of one night. 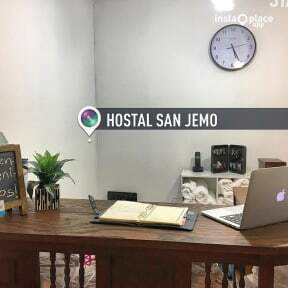 In Leon there are almost no options to stay on a low cost place that at the same time offer good location, safety, cleaning and friendly staff, this is why San Jemo came up as an option for all travellers to my hometown. San Jeronimo has changed a lot in the past few years since the public transportation station was located here, this represent to the area great mobility access and also many people coming to the area, so today you can find more and more shops, options to eat etc. The property is set in a building of about 20 years old, 3 floor building. We want to maintain our property in good shape so we encourage to our visitors to be careful and try to enjoy the place without any major disorder. Parties are not allowed in the building, smoking just in outside patios and no alcohol or any other drug is allowed inside the property. Location is pretty convenient, you can be very fast in main shopping malls, Parque Metropolitano and even the city zoo. The hostel is surrounded by many restaurants and bars. San Jerónimo is a good neighbourhood that is growing in services to offer due to their good location to many things. Hostal San Jemo offers comfortable and spacious dorms for 6 and 10 people. Perfect accommodations for a great and pleasant stay in the city at a reasonable price. No 24-hour reception. Opening time: from 8 am to 10 pm.